To see other badges of railway workers currently in stock, follow this link: "Soviet Railway Awards"
$650.00 Badge of a Shock Worker of Stalin Campaign for Large Harvest in Chelyabinsk Region, 1933. Variation with wire attachment of the Stalin's portrait. In outstanding condition. $450.00 Badge of a Shock-Worker of the Stalin Cotton Campaign, circa mid-1930s. In superb condition, very uncommon for this badge, and includes scarce original screw plate. $295.00 Badge for Excellence in Socialist Competition, Ministry of Automobile and Tractor Industry,	1947-1955. $130.00 Badge for Excellence in Socialist Competition of the Narkomat of Tank Manufacturing, 1942-46. This badge featuring a KV ("Kliment Voroshilov") heavy tank was the first Soviet civilian award instituted during the Great Patriotic War. In very fine condition, an attractive piece showing minor amount of wear but free of any glaring flaws. 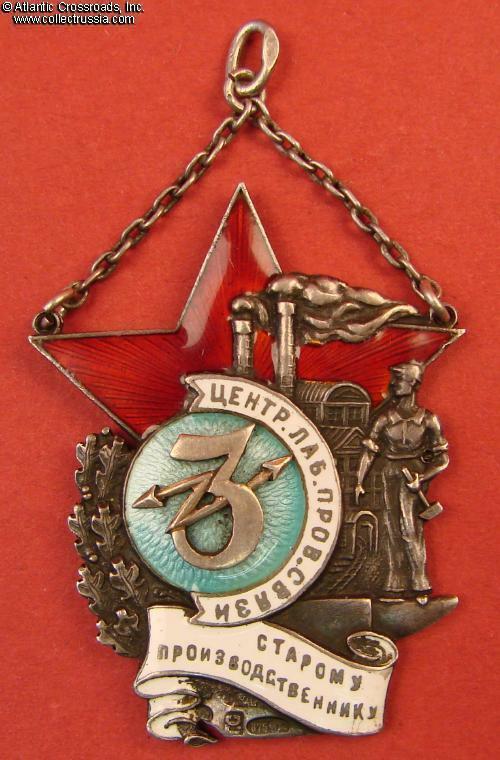 $375.00 Badge for Excellence in All-Union Socialist Competition, Narkomat of Shipbuilding, Type 1,	#341, circa 1942-43. Scarce wartime issue (note the extremely low serial number). $40.00 Award document for the badge Excellence in Socialist Competition of the Ministry of Shipbuilding Industry, 1956 issue. $150.00 Badge for Excellence in Socialist Competition, Narkomat of Coal Mining, Type 2 Var. 1	(flat back), #13343, 1941-1946. $160.00 Badge for Excellence in Socialist Competition, Ministry of Coal Mining Industry, Type 2, early 1950s. Excellent condition. $135.00 Badge for Excellence in Socialist Competition, Ministry of Construction Materials Industry,	#5545, 1946 - mid 1950s. Excellent condition. $290.00 Badge for Excellence in Socialist Competition, Narkomat of Ferrous Metallurgy,	Type 2, #15341, 1941-46. In excellent condition and includes original screw plate. $590.00 Badge for Excellence in Socialist Competition, Narkomat of Timber Industry, #10985, with temporary award certificate, December 1945 issue. Both the document and the badge are in outstanding condition. $260.00 Badge for Excellence in Socialist Competition, Timber Industry, #17276, 1946 - 1950s. In very fine to excellent condition. $280.00 Badge for Excellence in Socialist Competition, Ministry of Forest Industry, #8037, 1947 - 1950s. Fine condition. $90.00 Badge for 10 Years of Irreproachable Service with the State Forestry, circa 1950s. In excellent condition and includes original screw plate. $170.00 Badge for 20 Years of Irreproachable Service with the State Forestry, circa 1950s	. Extremely attractive and well made piece in outstanding condition. $490.00 Badge of Honored Road Builder, #7304, circa late 1940s - early 1950s. In near mint condition. $395.00 Honored Radio Operator of the USSR, Type 1 in silver, 1945 through late 1940s. Impressive piece in outstanding condition. $750.00 Badge for Excellence in Food Industry, #2023, circa 1938-39. Magnificent sterling silver badge, complete with the original hallmarked washer and wing nut. $95.00 Excellence in Socialist Competition, Narkomat of Food Industry, Type 2, #16031, circa 1945-46. Brass version with counter-relief to the reverse, in excellent condition. $1,390.00 Badge for Excellence in Flour Milling and Cereals Industry, Narkomat of Procurement, #1496, 1939 - 1946. In outstanding, excellent condition. $800.00 Badge for Excellence in Agricultural Procurement, Narkomat of Procurement, #6508, 1939 - 1946. In very fine to excellent condition. $120.00 Badge for Excellence in Socialist Agriculture, Narkomat of Plant Cultivation, 1942-1946. Fine to very fine condition. $420.00 Badge for Excellence in Socialist Competition of Craft Cooperatives (Promkooperatsiya) of Latvia, Type 1, #315, early 1950s. Extremely high quality. Very fine to excellent condition. $350.00 Badge for Excellence in Peoples Education of Karelo-Finn SSR, #160, early 1950s. Rare badge awarded prior to 1953 when the republic lost its full Soviet Republic status and became an autonomous republic within Russian Federation. In excellent condition. $275.00 Badge for Excellence in Finance, USSR Ministry of Finance, Variation 2, #012690, circa mid-1950s. A very attractive mint marked badge in near mint condition. $95.00 Badge for Excellence in State Labor Reserves, relief reverse variation, circa mid to late 1940s. Excellent condition. One the very few Soviet non-military badges instituted during the Patriotic War. $14.00 All-Union Agricultural Exhibition, participant's badge, circa 1954-58. Excellent condition. $190.00 Badge for Creative Successes #1180, 1951. Awarded to a Participant of the 10-Day Festival of Ukrainian Art and Literature in Moscow. In excellent condition.